"C'est La Vie" Oceanfront 5 Bedroom, 4 bath home. Two living rooms with ceiling fans. All bedrooms equipped with ceiling fans. Whirlpool. 7 Flat screen cable TV's, 4 DVD players, Showtime, phone, wireless internet access. Fully equipped kitchen includes dishwasher, microwave. Wet Bar with refrigerator in living area. Also an extra refrigerator for additional food/drink storage. Washer/Dryer. Outside Hot/Cold shower, furnished sundeck and covered porch, charcoal grill. 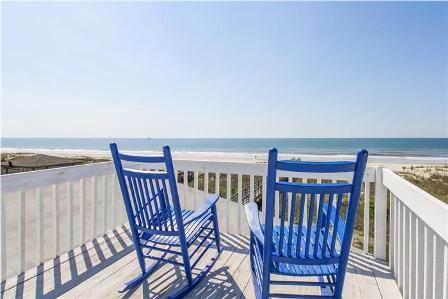 Take in fantastic beach and ocean views from widow's walk. Accommodates 16. Bedding - Upstairs: King, 2 Doubles. Downstairs: Queen, 2 Queens, 2 Queens. Bed linens and bath towel sets will be provided occupancy count. Dock Rental (close by) is available for additional weekly fee of $150. Please inquire for dock availability.